Congratulations to the participants of the 2019 Congressional High School Art Competition! 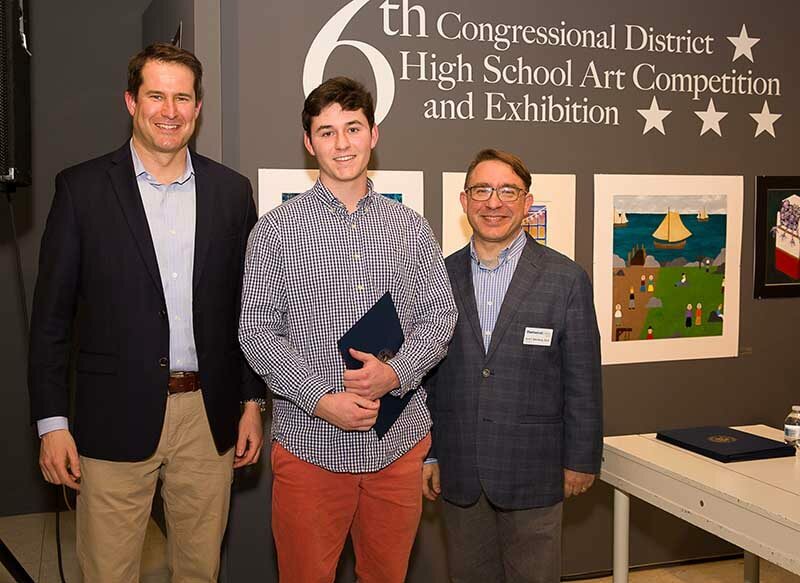 ​Aiden Heney of Hamilton-Wenham Regional High School won the Grand Prize in the 25th Sixth District Congressional High School Art Competition at Montserrat College of Art. A ceremony to present the awards was held in the college’s Montserrat Gallery March 23. The annual event is hosted by Montserrat for Congressman Seth Moulton, and student winners were presented with certificates and nearly $20,000 in scholarships for Montserrat’s Pre-College Summer Program. Aidan’s work will be sent to Washington DC for a June reception with the winners of all other Congressional District Competitions from across the US. It will be on display for one year. The exhibit included more than 115 pieces from 23 different public and private high schools within the 6th District of Massachusetts, as well as home-schooled students. The exhibition was juried by John C. Archer, Artist, President, Danvers Art Association, Danielle M. Olsen, Art & Nature Center Creative Producer, Peabody Essex Museum, and Rosalie Sidoti, Artist, Graduate Program Advisor, Tufts University School of the Museum of Fine Arts, Former high school art educator.